On November 28, 2018, the Hawaiʻi State Archives, a division of the Department of Accounting and General Services, in lieu of normal business hours, will be open to the public from 1:00-3:00pm at the Kekāuluohi Building on the ʻIolani Palace Grounds. 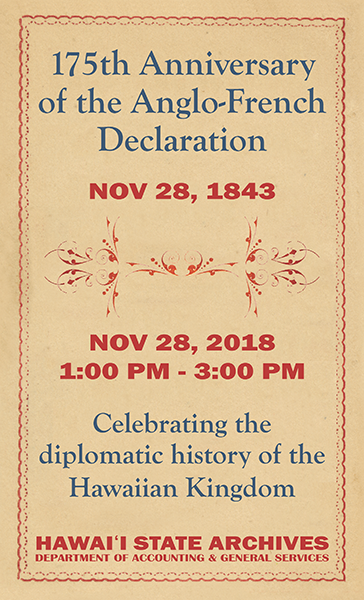 As part of the “Year of the Hawaiian”, this exhibition of original documents and artifacts is themed Celebrating the diplomatic history of the Hawaiian Kingdom in recognition of the 175th Anniversary of the signing of the Anglo-French Declaration on November 28, 1843. This declaration acknowledged the Hawaiian Kingdom as a diplomatic equal to the world powers of the time with a “government capable of providing for the regularity of its relations with foreign nations.” With this recognition foreign relations blossomed, international treaties were signed, and over 110 Hawaiian Kingdom consulates were opened around the world. 11:45am-12:45pm Lecture on Timoteo Haʻalilio in Kanaʻina Building, one of three Hawaiian Kingdom delegates who negotiated with European powers to achieve this historic recognition.